Brownman will be in New York on a variety of recording sessions at multiple studios in the city. Simpson’s The Sugar Bar, Café Wha, the Village Underground and Harlem’s Billie’s Black. An acclaimed younger star in the Toronto Jazz scene, Patrick Hewan is an adventurous modern piano player in the style of Bill Evans. (and he's too integral to the band to replace) -- so the OGGUERE show is being postponed to Sat-Jan-25. From Duke to Miles to Ella, this trio explores the great American Songbook. Standards played non-standardishly. “OMEGA MEN -- the unique combination of Brownman and Cutler -- dangerous, daring, and best served in the dead of night"
bond making them one of the most called upon horn teams in the country. Hear them in their own deeply funkified urban-jazz ensemble. Featuring 5-time National Jazz award winner for piano player of the year - DAVE RESTIVO as this month's "+1"
bombastic trumpet approach - in a stripped down, intimate duo setting, each month featuring a different +1. 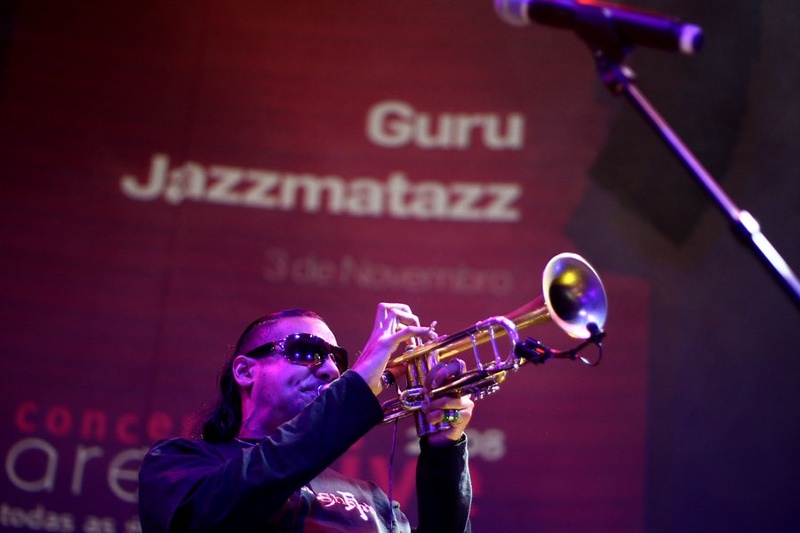 of jazz genres from jazz-funk to bossa to modern takes on classic standards. 2014 NEW YEAR'S EVE BASH! Ring in the new year with the Electryc Trio -- see below for full details! 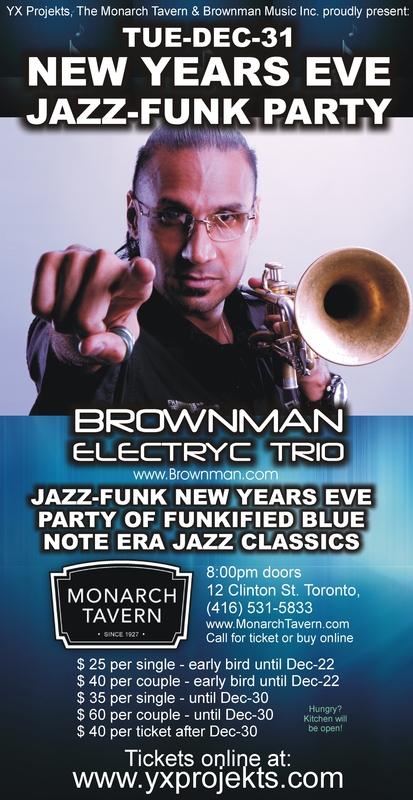 BRING IN THE NEW YEAR WITH THE BROWNMAN ELECTRYC TRIO playing the best of BLUE NOTE! but all groove-interpreted in forward-visioned Electryc Trio style. "Frosty the Snowman" and "Jingle Bells" - reworked in accordance to their own visions. Watch this space for updates & announcements on who's playing! Q: What's coming up for recordings? 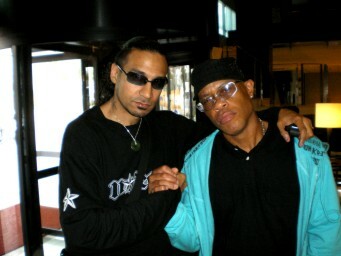 2006 ended for Brownman with the explosive "Jazz By Genre" presentation of legendary rapper of Jazzmatazz and Gangstarr fame - GURU, held in Toronto's revered Mod Club. This could have been just another 'backing band for out-of-town act' session for the often called Trinidadian trumpeter, but the chemistry between Brown and Guru was evident even back then on their first meeting. 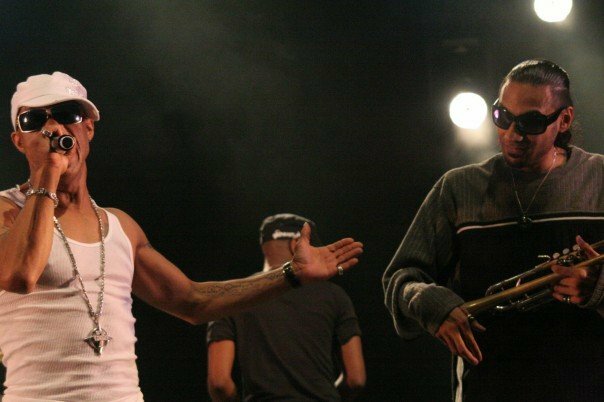 During that show Guru would push him out of his regular horn position to the front of the stage to solo while the hip-hop legend held a mic in front of his horn's bell. This single performance would lead to a phone call from Guru's team a month later asking Brown if he was available to make an appearance on the upcoming 2007 release of 'Jazzmatazz Vol. 4', replacing the luminious Donald Byrd as the featured trumpet soloist. Brown, accepting immediately, would write a special horn arrangement of "Universal Struggle" and solo throughout the tune. 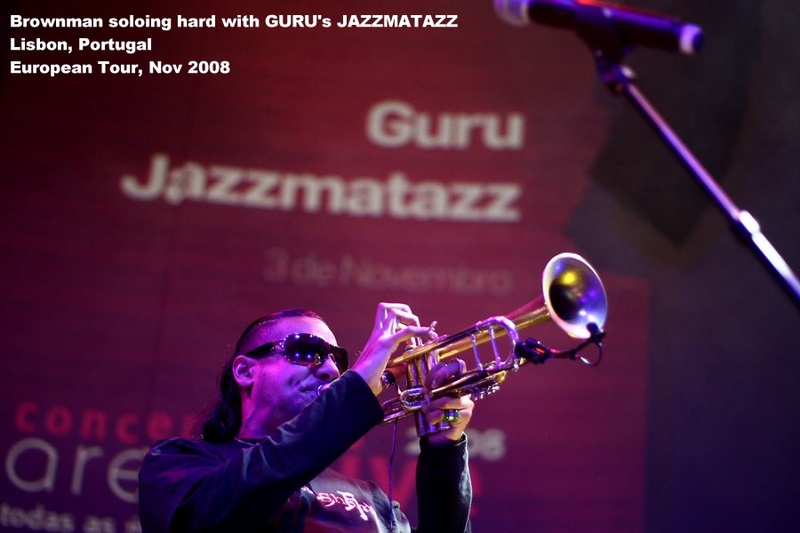 In early Feb '07 he was again contacted by Guru's people, impressed by Brown's work on the track, to ask him to tour America for the release of JAZZMATAZZ VOL. 4. 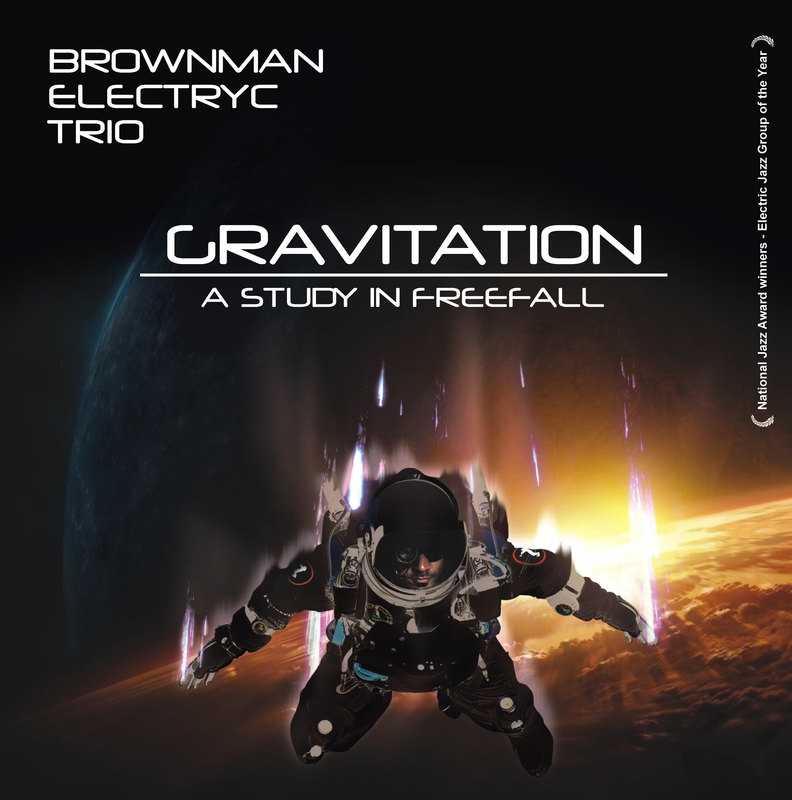 Since then Brownman has been touring the world as the featured soloist with GURU's JAZZMATAZZ as they brought their unique breed of jazz-hip-hop through The United States, Europe, Japan & South America. See extensive YouTube archive of tour footage. 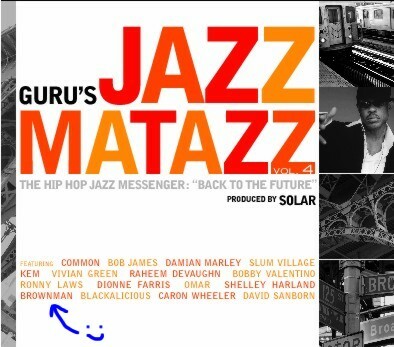 In Jan 2010, Both Brownman & DJ DooWop left Jazzmatazz together, their exit precipitated by the often reported meglomaniacal ways of Solar - Guru's producer. Guru had, over time, had slowly given up control of all affairs to Solar who, in turn, continued to abuse and manipulate the entire team, from Guru himself through the organization's entire infra-structure. On Apr 19th, 2010 Keith "Guru" Elam died after a long battle with cancer. For more on the fiasco behind Solar's dominance over Guru visit : FuckSolar.com - a fan driven website dedicated to documenting Solar's downfall. See Brownman's unabridged 3000 word interview with the Boston Phoenix, reprinted with permission by FuckSolar.com, where he details all he saw while with Jazzmatazz. BROWNMAN T-SHIRTS ARE NOW IN! Official Brownman t-shirts have just arrived and are available at all live shows (or email andrew@brownman.com to order by mail). Sizes are XL, L, M, S. Limited quantities per size. $20 each. Kittens, rappers and girls not included. Ms Dyamite, DJ Doowop, Guru... and Brownman! "The Life & Times of Brown" -- In 2007 the BRAVO! 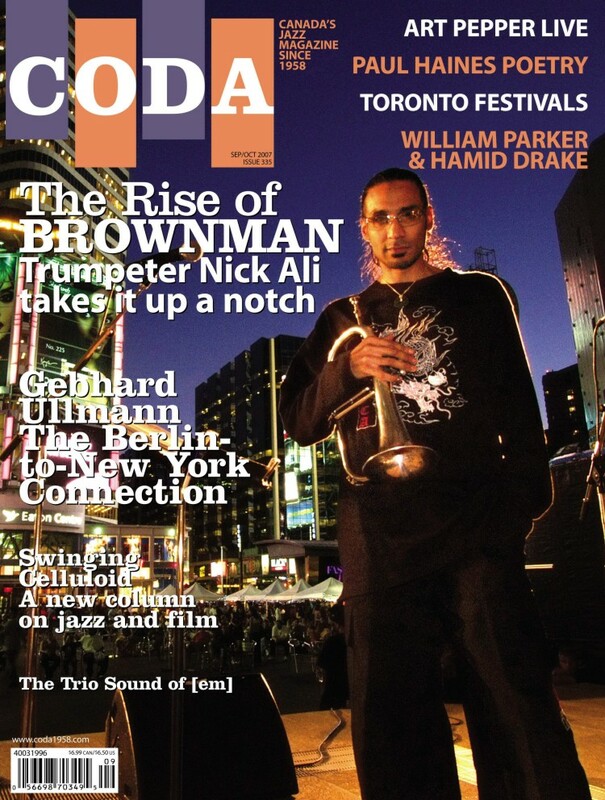 channel, in conjunction with Leda Serene Films aired this 1/2 hour documentary on the life of award-winning Trinidadian born jazz trumpet player BROWNMAN ALI -- now available for free viewing in it's entirity on Vimeo. It is an insightful and in-depth look at one of the most acclaimed jazz artists in the nation, diving deeply into his personal history, growing up in a racial charged environment, his time in New York City with Randy Brecker & clearly illustrating why he is now widely considered a vanguard for the evolution of jazz in Canada. EDITOR'S NOTE: This documentary was filmed in 2006 just *before* he was asked to join the legendary GURU's JAZZMATAZZ, replacing Donald Byrd in that seminal jazz-hip-hop group, and is thus a fascinating look at his pre-Jazzmatazz career. 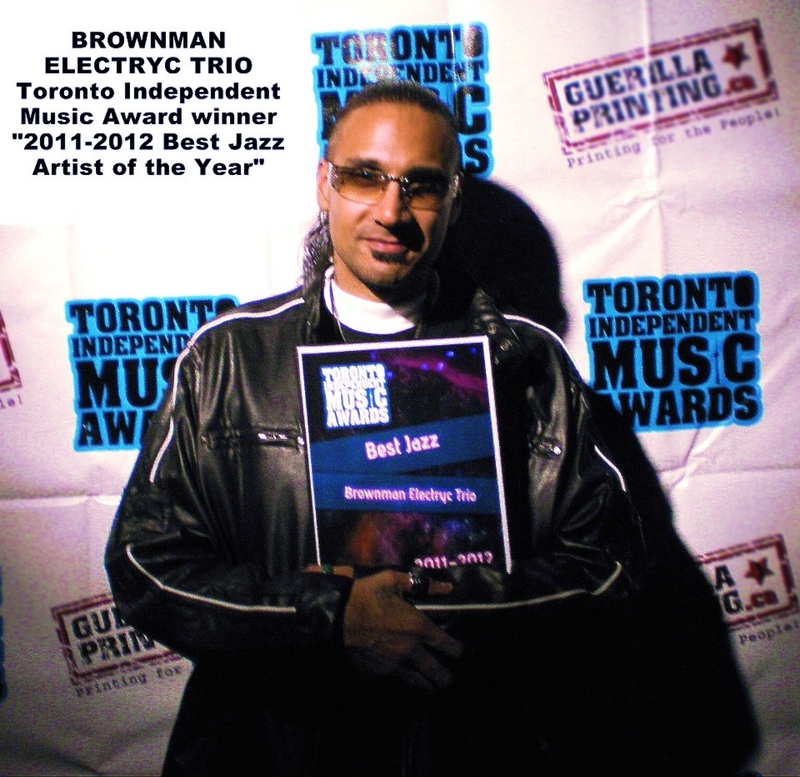 After being nominated in 5 categories at the 2007 Canadian National Jazz Awards, the BROWNMAN ELECTRYC TRIO was honoured to have been awarded the 2007 National Jazz Award for Electric Jazz Group of the Year. Thanks to all that voted! 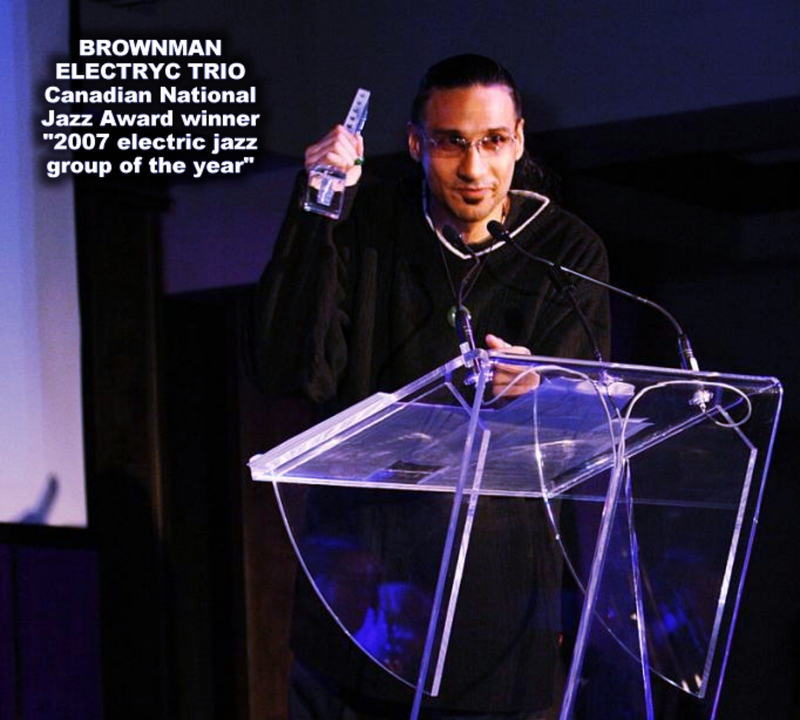 Brownman was nominated for a 2006 Canadian National Jazz Award for "Latin-jazz Artist of the Year". The prize was awarded to the luminous and deserving Hilario Duran, but we at Brownman Music Inc. would like to thank all those who voted for this dynamic performer! Shortly after returning from the last South American tour in Jan '06, the BROWNMAN ELECTRYC TRIO began a new jazz residency at Buffalo's ultra hip Allen St. Hardware Cafe... this residency will continue through summer and all of upstate NY is invited to join the party! No longer able to deny the undeniable - Brownman Music now has a MySpace.com page. There are 4 tunes and some video from CRUZAO is currently loaded (though they will be on weekly rotation), pics, and a ton more. Feel free to drop in and make Brown your MySpace friend. Brownman recently appointed to the Prague Jazz Open Festival's Board of Artistic Directors where his knowledge and expertise will aid in shaping the vision of the festival's 2006/2007 programming. Collaborations seems to be the name of the game in 2006 and we'd like to mention some of those fantastic groups that have featured Brown in recent months: IRAKERE, CHISPA Y LOS COMPLICES, TUMBAO INC., DUB TRINITY, KUSH, FERTILE GROUND, SOULIVE, KOBOTOWN, KELLY LEE EVANS, MR. SOMETHING SOMETHING, METHODOLOGY, JAH-B, MAPALE, CHIVA, RITA DI GHENT & The SPRAWL PROJECT, AVE RD. & CESCO. All are world-class ensembles and we encourage those reading this to put their names into Google and check out their artistry. Copyright © 1998 Brownman Music Inc. All rights reserved. .Site Updates : just about eeeeevery damn day. Dig that!